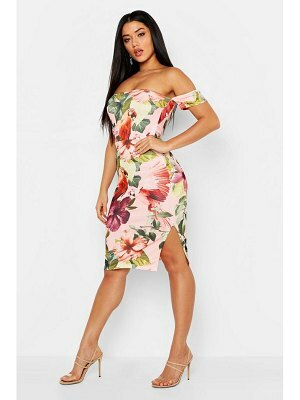 ""Midi dress by Lavish Alice, Woven fabric, Bandeau neckline, Strapless design, Belted waist, Split hem, Zip back fastening, Regular fit - true to size, Hand wash, 95% Polyester, 5% Elastane, Our model wears a UK 8/EU 36/US 4 and is 175cm/5'9" tall. Lavish Alice represents directional design with a bold signature. Cut to enhance the silhouette and heighten the body, capes, asymmetry, cutaway details and a clean, minimalist aesthetic evolve with the seasons, underpinned by sharp tailoring, sartorial bodycon, experimental fabrics and abstract prints."